There were quite a few invites that have been sent to people from different walks of life for the swearing-in ceremony of Narendra Modi as Prime Minister of India. Superstar Rajinikanth was also invited but it was stated that he would not be attending the ceremony but his wife Latha Rajinikanth would represent the actor at the ceremony. 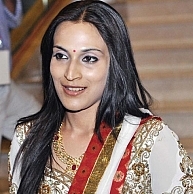 However, at the swearing-in ceremony of Narendra Modi, Rajinikanth’s elder daughter Aishwarya Dhanush was spotted. She was representing her dad Rajinikanth and was seen sitting next to actor/politician Vinod Khanna. Is this the 'Thala 55' makeover? Who Does Superstar Rajinikanth Follow? Will Superstar Rajinikanth's Kochadaiiyaan Release On May 23? People looking for online information on Aishwarya Dhanush, Narendra Modi swearing in ceremony, Rajinikanth will find this news story useful.